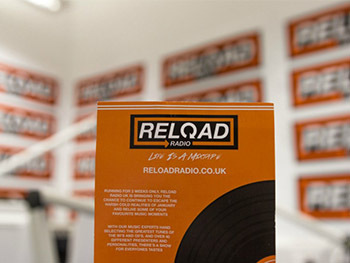 Reload Radio was an exciting project that allowed third year BA (Hons) Media and Communications students to put their skills into practice by running a live radio station. Covering all areas of radio production, students were involved in brand building, marketing, social media activity and of course, presenting and producing the station. The station’s primary mission was to recreate those “Wonderwall Moments”, with an aim to continue the warmth and cheer following the recent festivities. We wanted to transport the audience from the cold January blues to a time filled with unforgettable memories and good spirits. As well as getting listeners singing along to a selection of classic hits from the 90’s and 00’s, the students also put together a host of talk shows, documentaries, special guests and worked closely with a group of MA Journalism students to create real time news updates. Rachel told us a little more about her experience with Reload Radio. Can you tell me a little more about Reload Radio and your involvement? Reload radio is more than just an aired playlist. It took huge amount of efforts from the entire team and required individuals to explore new areas and develop skills which can be used in future employment. I took on the role of Marketing Manager and was able to get involved in the concept through to delivery. Highlights include liaising with local businesses such as Nando’s and Propaganda for giveaways, presenting my own live show and interacting with listeners over social platforms to discuss ‘Track of the Day’ and of course, reminiscing over throwback CD players! Were you nervous about the project at all? Team building skills were essential and it was a great opportunity to speak to others outside of our usual friendship groups. Naturally I was a little nervous when it came to public speaking, I set myself a challenge with speaking live on air and it has proven to be very rewarding. The support from staff, team and audience was very encouraging! How do you think this project will help with your studies and plans for the future? The project was really useful in terms of putting theory into real life scenarios instead of hypothetical. This included using the Ofcom code (broadcasting guidelines), liaising with working professionals and overcoming my fear of public speaking. My eyes have been opened to new career paths - I want to do it all! What advice would you give to students who are looking to do join the media course? I was a little sceptical about applying for the course as I felt I wasn’t experienced enough and I didn’t have a portfolio. As long as you have that initial interest, the opportunity is there. Studying media you will have access to some great equipment and have plenty of time to practice, perfect and specialise in your area of interest. If you have an interest pursue it! Overall Reload Radio was a success and enjoyed by both the students and listeners. The station went live at 8am on the 15th January for a two week duration. The live stream was a combination of live and pre-recorded sets which could be accessed at Reloadradio.co.uk. The students are sad to say goodbye to months of hard work and preparation. They are very pleased with the results and the engagement received. To revisit some of the show highlights take a look at Reload Radio's mixcloud, Facebook and Twitter.